Comfortis Flea Tablets are the newest flea control product on the market. Comfortis is the first APVMA and FDA-approved, chewable tablet that kills fleas and prevents flea infestations on dogs for a full month. Acclaimed worldwide as the breakthrough flea treatment of the 21st Century, Comfortis has quickly become recognized by vets and pet owners as the best flea treatment for dogs yet discovered. Only Comfortis offers you all of these benefits in a single product: Starts killing fleas within 30 minutes. Lasts a full month. Kills fleas before they can lay eggs. The convenience of a chewable, synthetic beef-flavored tablet. Spinosad, the active ingredient in Comfortis, is environmentally friendly. Comfortis– the latest breakthrough in flea protection is the first FDA-approved, chewable tablet that kills fleas and prevents flea infestations on dogs for a full month. The convenience of a chewable, synthetic beef-flavored tablet. Spinosad, the active ingredient in Comfortis, is environmentally friendly. Brown box for dogs 27.1 - 54 kg (60.1 to 120 lbs) (1620mg). How should this medication be given: Give Comfortis chewable tablets with food. Give Comfortis chewable tablets once a month. Comfortis chewable tablets may be chewed, offered in food, or administered like other tablet medications. If vomiting occurs within 1 hour of administration, redose the pet with another full dose. Store Comfortis at room temperature. What are the possible side effects of Comfortis: Side effects that may occur include vomiting. If vomiting occurs within one hour of administration, redose with another full dose. Other side effects may occur. Discontinue giving Comfortis chewable tablets and talk to your veterinarian if your pet experiences decreased appetite, lethargy or decreased activity, diarrhea, cough, increased thirst, vocalization, increased appetite, redness of the skin, hyperactivity and excessive salivation. Talk to your veterinarian about any side effect that seems unusual or especially bothersome to the pet. Where can I get more information: Your veterinarian has additional information about Comfortis written for health professionals that you may read. Petsvetshop is the best place to buy Comfortis tablets for your dog, with discount prices, fast friendly service, quality guarantee and the professional advice that only a qualified Vet can give you. 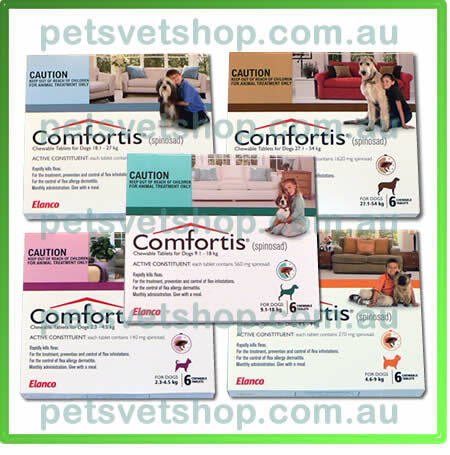 Buy Comfortis from Petsvetshop for fast shipping using our Ezy Order checkout with no hassles and your order will ship today for our Supersaver flatrate shipping price. 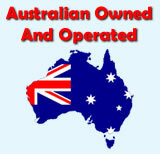 At Petsvetshop you can buy Comfortis without prescription - no prescription needed.